They came from ten countries around Africa and as far away as Guatemala, representing thirteen nationalities. 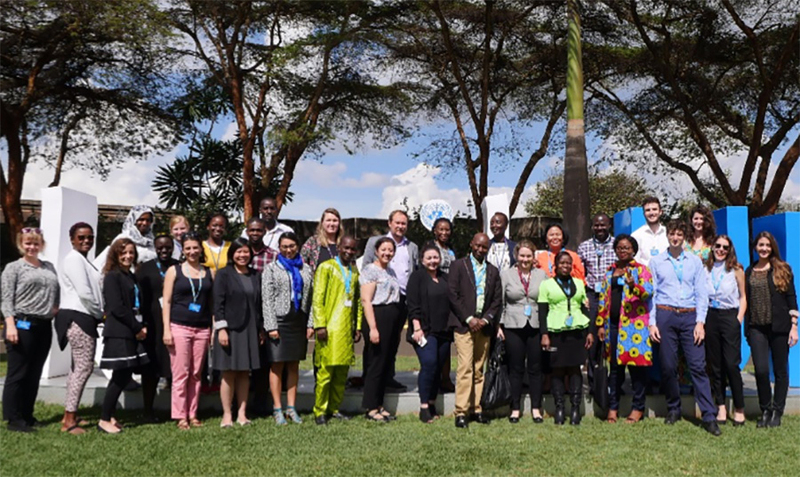 Twenty-five UN Volunteers gathered in Nairobi from 7-9 November 2017 for the second Learning and Strategy Workshop on Gender-Responsive Peacebuilding (#GRPB) organized by UN Volunteers, UN Women and the UN Peacebuilding Support Office (PBSO). The UN Volunteers are making a unique contribution to increasing women’s participation in peacebuilding and utilizing gender-responsive approaches to improve peacebuilding outcomes. Participants in the the second Learning and Strategy Workshop on Gender-Responsive Peacebuilding in Nairobi. They came to share their experiences, learn from each other and build a network of colleagues and friends to help them overcome the many difficulties they face in challenging contexts like Mali, the Democratic Republic of thr Congo, Liberia and elsewhere. According to Wouter Theibou, the Programme Specialist for Peacebuilding at UN Volunteers’ headquarters in Bonn, the workshop was an opportunity “to find common strategies to effectively deliver on peace and development.” Working on gender equality is difficult everywhere in the world, but often particularly so in post-conflict and fragile settings. Strong networks of practitioners across the globe is particularly important when it comes to gender because our work is often under-funded, under-staffed and marginalized. Learning from each other, we can share success and commiserate over failures, thereby strengthening our understanding of what can work. Since 2014, UN Women, UN Volunteers and the UN Peacebuilding Support Office have partnered to deploy pairs of national and international UN Volunteers to support projects under the Peacebuilding Fund’s Gender Promotion Initiative. The Gender Promotion Initiative is a special call for proposals on gender-responsive peacebuilding in select countries. In 2016, the Peacebuilding Fund allocated funding directly to civil society organizations for the first time. In Guatemala, the Volunteers are supporting the “Grandmothers of Sepur Zarco” to hold perpetrators of sexual slavery to justice years after the country’s long civil war. This work resulted in the first ever conviction of conflict-related sexual violence in a domestic court in 2016, which UN Women and partners are now following up on to make sure the survivors get justice. In Liberia, the Volunteers are supporting Educare, a Liberian civil society organization, to engage women through Peace Huts to mediate conflicts over natural resources in areas where multi-national companies are exploiting and profiting from Liberia’s abundant ecological and geological wealth. Recognizing women’s distinct knowledge and analysis of conflict drivers and patterns, Volunteers in Cote d’Ivoire are supporting a UN Women project to increase women’s role in early warning and conflict prevention. In Mali, Volunteers are supporting InterPeace and the Malian Institute for Peace Action Research (IMRAP) to improve the public’s confidence in security institutions through increasing women’s participation in the security sector. As one of the facilitators of this workshop, I had the privilege to share and learn from the participants as well. We now have near insurmountable evidence about the difference that women’s participation in peace and security makes in terms of effectiveness and sustainability. But, we still see too few women when it comes to peace and security decision-making and too few resources and opportunities for women’s participation in peacebuilding. Across the world, political resistance and entrenched bias (that can even sometimes manifest in violence) continue to limit women’s career growth, access to resources and power and the very ability to care for ourselves and our families. Decades of experience shows that these barriers can best be overcome through strong networks of like-minded policy-makers and practitioners. By learning from each other, the UN Volunteers and the facilitation team are contributing to a support system and a global community committed to increasing women’s participation in peacebuilding. Sarah Douglas is the Gender Adviser at the UN Peacebuilding Support Office. Previously, she was a Policy Specialist in the Peace and Security team at UN Women, leading the sections to work on gender-responsive peacebuilding. Prior to joining UN Women, she worked for UNDP and the UN Mission in Sudan (UNMIS) on DDR and Community Security and Arms Control programmes in Sudan and South Sudan, ensuring that gender and women’s issues were integrated throughout programme design, implementation and monitoring. She was with UNIFEM Peace and Security section from 2003 to 2006. She has an MSc in Gender and Development from the London School of Economics and an undergraduate degree in Women’s Studies from the University of Michigan. This blog first appeared as a guest blog by Sarah Douglas at Impactpool.